In 2015 the polling establishment and the mainstream media had in unison proclaimed that the 2015 general election was too close to call, one where the Labour and Conservative parties were neck and neck and where even if the Conservatives managed to pull a handful of seats ahead would still lose by default as they would not be able to form a majority even with Lib Dem support and therefore the Labour party appeared destined to win the 2015 general election, all of which was based on a year of opinion polls that consistently presented this consensus view right up until the polls closed! As a reminder the consensus was for the Conservatives would win just 270 seats, where even the BBC's exit poll AFTER the polls had closed at 10pm proved WRONG by forecasting the Conservatives would FAIL to win an outright majority on 316. However, what did prove highly accurate in forecasting the outcome of the 2015 General was my market skewed perception based on my house prices trend trajectory forecast that forecast the Conservatives would win the 2015 General Election with on a single digits majority of approx 328 against the actual outcome of 330. 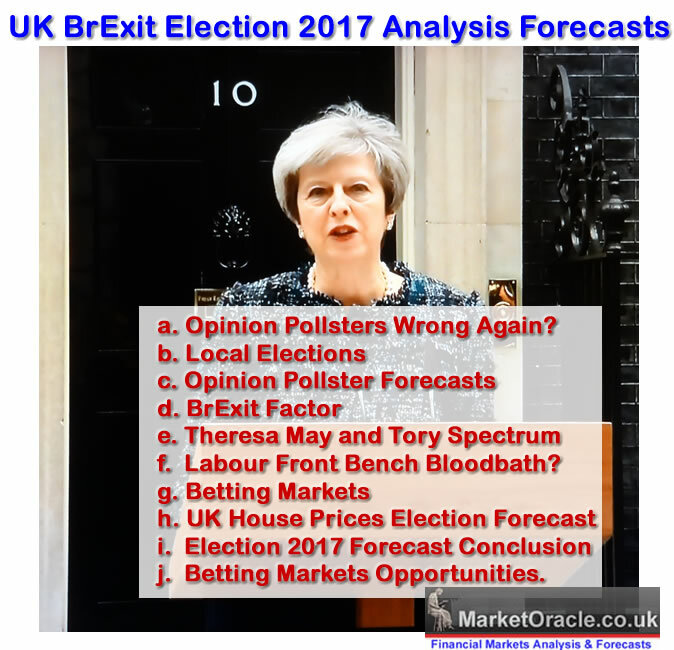 So find out in my latest video in the BrExit election series what UK house prices are now forecasting for the outcome of the June 8th General Election.